Not to be confused with Michael Bourne. Michael Ray Bourn (born December 27, 1982) is an American professional baseball center fielder who is a free agent. He has played in Major League Baseball (MLB) for the Philadelphia Phillies, Houston Astros, Atlanta Braves, Cleveland Indians, Arizona Diamondbacks and Baltimore Orioles. He has also been a member of the United States national baseball team. Bourn was raised in Houston, Texas, where he attended Nimitz High School and the University of Houston, playing baseball. He was named to the NL All-Star team in both 2010 and 2012 and won consecutive Gold Glove Awards in 2009 and 2010. Bourn also led the MLB in stolen bases in 2011, and led the National League in stolen bases from 2009–2011. He is currently 157th place on the all-time Major League Baseball stolen base list with 326. 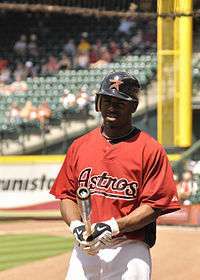 Michael Ray Bourn was born in Houston, Texas on December 27, 1982, the first of two sons to parents Carrie and Raymond. As a child, Michael played three sports, baseball, basketball and football. His Little League team was coached by his father. Teammates included Carl Crawford. At the age of 10, his father had him facing 85-mile-per-hour (137 km/h) pitching in a batting cage. Bourn attended Nimitz High School in Houston. He earned a scholarship to play college baseball at the University of Houston for the Houston Cougars baseball team, competing in NCAA Division I. He played with the Cougars for three seasons. While he displayed little power, collecting only two home runs and 23 extra-base hits in 644 at-bats, he won attention from professional scouts by posting a .431 on-base percentage and stealing 90 bases in 119 attempts. He was named to the All-Tournament Team at the 2002 Conference USA Baseball Tournament, in which Houston was the runner-up. In June 2003, following his junior year, the Philadelphia Phillies drafted Bourn in the fourth round, with the 115th overall selection of baseball's first-year player draft. Bourn signed shortly after the draft, and was assigned to play for the Batavia Muckdogs of the Class A-Short Season New York–Penn League. In 2004, Bourn was the starting center fielder with the Lakewood BlueClaws of the Class A South Atlantic League. Bourn ended the season with a .433 on-base percentage and an OPS of .903, earning 85 bases on balls in 109 games. He also stole 57 bases in 63 attempts – a success rate of over ninety percent. Following the season, he was named to Baseball America's Top Ten Prospects list for the Phillies organization. Bourn started the 2006 season with the Reading Phillies of the Class AA Eastern League, and was promoted to the Scranton/Wilkes-Barre Red Barons of the Class AAA International League late in July 2006. In early September 2006, Bourn took a brief hiatus from his professional obligations to play for the USA Olympic qualifying team, for whom he hit two home runs to help Team USA defeat Cuba in the gold-medal game. 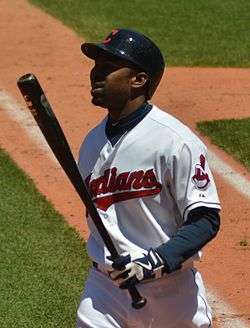 Bourn was then promoted to the expanded major league roster. He was sent to home plate to bat only 11 times during the month of September, but was used frequently as a pinch runner as the Phillies competed for the National League's wild card position (ultimately coming up two games short) to the Los Angeles Dodgers. Disappointingly, he stole only one base in three attempts during the month, and was memorably tagged out after accidentally oversliding second base on a steal attempt in a late-season loss against the Washington Nationals on September 26, 2006. After a strong performance during spring training in 2007, Bourn won a position on the Phillies' major league roster to begin the year. He was used sparingly, appearing primarily as a frequent defensive replacement in left field for Pat Burrell. 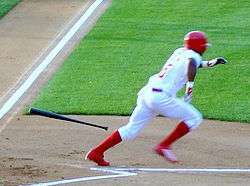 On July 15, 2007, Bourn hit his first career home run as the Phillies recorded their 10,000th franchise loss by losing to the St. Louis Cardinals 10–2. On July 27, Bourn was in the Phillies' starting lineup for the first time due to injuries to both Chase Utley and Aaron Rowand, and had his first 4-hit game in an 8–1 rout of the Pirates, in which he scored two runs. Bourn finished third among all NL rookies with 18 stolen bases, and was caught only once. He batted .277. On November 7, 2007 Bourn was traded along with Geoff Geary and Mike Costanzo to the Houston Astros for Brad Lidge and Eric Bruntlett. Houston's General Manager, Ed Wade, declared Bourn as the 2008 Astros' leadoff hitter and starting center fielder, effectively moving Hunter Pence to right field. Bourn stole 41 bases in 2008. Among players who had enough plate appearances to qualify, Bourn's OPS was the worst in the Majors in 2008. He finished the season with a .229 batting average and a major league-low .288 on-base percentage and a major league-low OPS of .588, while striking out 111 times in his 467 at-bats. In 2009 spring training, Bourn led all players in steals, with 13, while being caught twice. Bourn had a major turnaround year, as he finished with 61 stolen bases, which was the most in the National League and second in the Majors only to the 70 steals by Jacoby Ellsbury, to go along with a .285 BA and a .354 OBP in 157 games, as well as 27 doubles and 12 triples (tied for second most in the Majors with Stephen Drew) in 606 ABs. Bourn's OPS went from .588 in 2008 to .738 in 2009, which was the eighth best improvement in the Majors. His much improved play prompted former manager Cecil Cooper to informally name him the club MVP before he was fired. The Houston chapter of the Baseball Writers' Association of America formally named Bourn the Astros 2009 team MVP shortly after the end of the season. Changing his uniform number to 21, Bourn followed up his breakout season with another successful year in 2010, being elected to the National League All-Star team and was in the outfield when the final out of the game was recorded. Bourn suffered an oblique injury on September 19 while swinging at a pitch, causing him to miss the final 3 weeks of the season. He finished the year hitting .265 with a .341 on-base percentage and a .346 slugging percentage. He won a Fielding Bible Award for his statistically based defensive excellence in center field during the year. He was later awarded his second consecutive Gold Glove award on November 10. 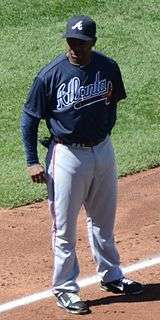 In July 2011, prior to the trade deadline, Bourn was traded to the Atlanta Braves for Jordan Schafer, Brett Oberholtzer, Paul Clemens and Juan Abreu. Bourn finished 2011 with a career best .294 batting average and 61 stolen bases (39 with the Astros and 22 with the Braves). Bourn was named a candidate in the All-Star Final Vote, with the winner being added to the 2012 MLB All-Star Game roster. Bourn finished second behind David Freese but was added to the roster a day later as a replacement for the injured Ian Desmond. In 2012, Bourn hit .274 and with a .739 OPS for the Braves. He stole 42 bases and hit a career high nine home runs. His 155 strikeouts were a new career high. Bourn finished 18th in the voting for the N.L. MVP. In November, Bourn rejected the Braves $13.3 million qualifying offer and became a free agent. On February 11, 2013, Bourn agreed to a four-year, $48 million contract with the Cleveland Indians that includes a vesting option for 2017, which would be met if he records 550 plate appearances in the final guaranteed year, 2016. He is the Tribe's first player to wear a number 24 on his back since Grady Sizemore from 2004 to 2011. Bourn played in 130 games in 2013, as he battled injuries throughout the season. He had 23 steals, which was his lowest total since 2007, when he was with the Philadelphia Phillies. On May 27, 2014, Bourn robbed White Sox captain Paul Konerko of a two-run homer in the 8th inning. The Indians lost that game 2–1. On May 30, Bourn collected his 1,000 career hit in eventual win over the Colorado Rockies. Two days later on June 1, Bourn hit a walk-off two-run home run to lead the Indians to a 6–4 win over and three–game sweep of the Rockies. Bourn struggled offensively to begin the 2015 season. On April 26 against the Detroit Tigers, he was dropped from the leadoff spot in the lineup for the first time as a Cleveland Indian as a result of his struggles, batting ninth instead. On August 7, 2015, the Indians traded Bourn and Nick Swisher with cash considerations to the Atlanta Braves for Chris Johnson. He was designated for assignment on April 2, 2016, and released on April 14. Bourn signed a minor league contract with the Toronto Blue Jays on April 22, 2016. He was assigned to the Advanced-A Dunedin Blue Jays, and hit .257 in 9 games before being released on May 7. On May 10, 2016, Bourn signed a minor league contract with the Arizona Diamondbacks. The Diamondbacks assigned Bourn to the Mobile BayBears of the Class AA Southern League. After playing in five games for Mobile, the Diamondbacks promoted Bourn to the major leagues. In 89 games with the Diamondbacks, Bourn slashed .262/.307/.373 with 21 extra-base hits while driving in 30 runs and stealing 13 bases. The Diamondbacks traded Bourn to the Baltimore Orioles for Jason Heinrich on August 31, 2016. Bourn made an immediate impact with the O's with his offense, speed and defense, including an outfield assist to end the game in a 5-4 win against the Rays to preserve teammate Zach Britton's perfect season as a closer. Michael has one son, Bryson, who was born in 2009. ↑ Bastian, Jordan (June 12, 2014). "Bourn takes lessons from father full circle". MLB.com. Retrieved April 24, 2016. ↑ Lemire, Joe (August 8, 2011). "Childhood friends Bourn, Crawford watch careers take different paths". Sports Illustrated. Retrieved April 2, 2016. ↑ "2-Michael Bourn". Houston Cougars Athletics. Retrieved June 22, 2016. ↑ "2012 Conference USA Baseball Media Guide". p. 93. Archived from the original (PDF) on June 21, 2012. Retrieved June 21, 2012. ↑ "Cards' HRs send Phillies to 10,000th franchise loss". ESPN. July 16, 2007. Retrieved June 22, 2016. ↑ "Phillies land Lidge in five-player trade with Astros". CBSSports.com. November 7, 2007. Retrieved August 24, 2009. ↑ "2008 Major League Baseball Advanced Batting". Baseball-Reference.com. Retrieved August 7, 2015. ↑ "Astros' Bourn among most improved in baseball". The Unofficial Scorer. Retrieved August 7, 2015. ↑ "Sortable Player Stats". Major League Baseball. Retrieved August 7, 2015. ↑ "Astros notes: Wade beginning hunt for new manager". Houston Chronicle. Retrieved August 7, 2015. ↑ "Astros outfielder Bourn selected to first All-Star team". Houston Chronicle. Retrieved August 7, 2015. ↑ "Astros notes: Bourn leaves game with strained oblique". Houston Chronicle. Retrieved August 7, 2015. ↑ "Bourn wins second straight NL Gold Glove". Major League Baseball. Retrieved August 7, 2015. ↑ "Braves finalize deal with Astros to acquire speedy center fielder Michael Bourn". Major League Baseball. Retrieved August 7, 2015. ↑ Breen, Matt (July 5, 2012). "Bryce Harper loses Final Vote to join All-Star Game". The Washington Post. Retrieved July 6, 2012. ↑ Wagner, James (July 7, 2012). "Ian Desmond to miss all-star game because of sore oblique". The Washington Post. Retrieved July 7, 2012. ↑ "Michael Bourn Statistics and History". Baseball-Reference.com. Retrieved January 31, 2013. ↑ "2012 Awards Voting". Baseball-Reference.com. Retrieved January 31, 2013. ↑ "Michael Bourn turns down Braves' qualifying offer | MLB.com: News". Mlb.mlb.com. Retrieved January 31, 2013. ↑ "Michael Bourn, Indians agree to 4-year contract, according to report". SI=February 11, 2013. ↑ "Michael Bourn » Statistics » Batting – FanGraphs Baseball". fangraphs.com. Retrieved August 7, 2015. ↑ Kiesel, Connor (May 28, 2014). "Leaping like Lofton! Bourn makes fabulous homer-saving grab". Fox Sports. Retrieved April 15, 2016. ↑ Bourn's 1,000th hit. MLB.com. May 28, 2014. ↑ "Colorado Rockies vs. Cleveland Indians – Recap – June 01, 2014". ESPN. Associated Press. June 1, 2014. Retrieved June 1, 2014. ↑ Josh Poloha (April 26, 2015). "Michael Bourn moved to ninth spot in the lineup on Sunday". waitingfornextyear.com. Retrieved May 5, 2015. ↑ "Indians trade Nick Swisher, Michael Bourn to Atlanta Braves". fox8.com. Retrieved August 7, 2015. ↑ Bowman, Mark (April 2, 2016). "Braves regretfully cut Bourn; Bonifacio, too". MLB.com. Retrieved April 2, 2016. ↑ Piecoro, Nick (April 14, 2016). "Diamondbacks considering free agent Michael Bourn". Arizona Republic. Retrieved April 15, 2016. ↑ "Blue Jays' Chris Colabello banned 80 games by MLB for PEDs". ESPN.com. April 23, 2016. Retrieved April 23, 2016. ↑ Adams, Steve (May 9, 2016). "Blue Jays Release Michael Bourn". mlbtraderumors.com. Retrieved May 9, 2016. ↑ "Florida State League Transactions". MiLB.com. p. May 2016. Retrieved May 9, 2016. ↑ "Diamondbacks sign Michael Bourn to minor-league contract". azcentral.com. May 10, 2016. Retrieved May 10, 2016. ↑ Simon, Andrew (August 31, 2016). "D-backs deal Bourn for Minors outfielder Heinrich". MLB.com. Retrieved September 6, 2016. ↑ Rogers, Carroll (July 7, 2012). "Bourn named to NL All-Star team". The Atlanta Journal-Constitution. Retrieved November 12, 2012. Wikimedia Commons has media related to Michael Bourn.